If you want an easy way to bank £1,318.60 – £6,593+ in the next 12 months on Betfair without being glued to your screen all day please read on. You see I’ve finally cracked it. I’ve developed a proven, no-nonsense, step-by-step betting plan you can start using today. There’s no guesswork, boring research or screen monitoring – just follow the simple steps each day and that’s it. I designed this to give you the freedom to make an extra income from betting whatever your level of experience or schedule. Whether you’re a dabbler, pro or complete betting newbie I can help you profit. All you need is an Internet connection and a few minutes spare each day. It certainly beats the hell out of slogging your guts out at a desk all day! 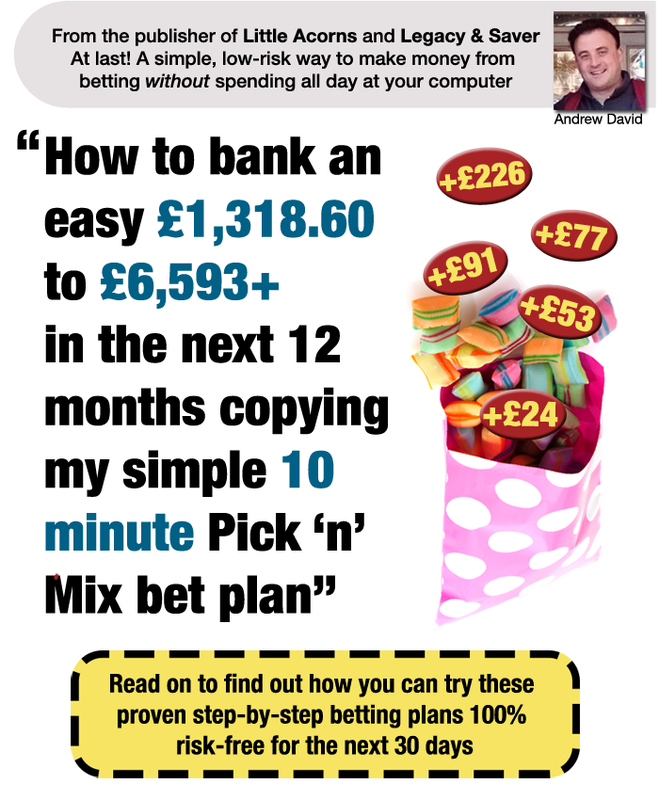 Each plan takes just 10 minutes to set up and run and you could have used them to bank 617 points profit last year. You can dip in and out as often as you like and simply pick ‘n’ mix the plans as and when it suits you. My name’s Andrew David. You may have heard of me before. Over the years I’ve developed a number of popular and successful betting strategies, including Little Acorns, Football Bank Builder, Legacy & Saver and Price Equalisation Method. 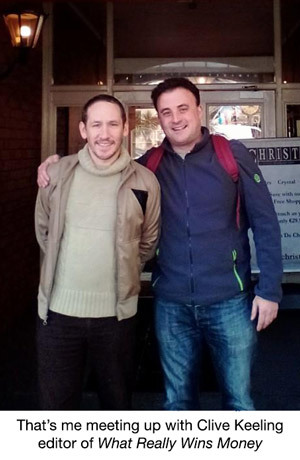 I’m also a regular contributor to a number of quality betting and gaming newsletters, including Clive Keeling’s What Really Wins Money (that’s me in the picture on the right with Clive). 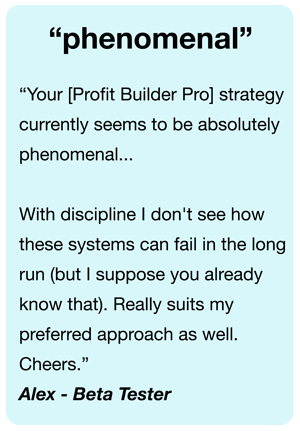 If you’ve followed any of my systems, you’ll know that I design my strategies to be as simple as possible. How to create a betting plan that’s quick and easy to run each day and doesn’t involve hours checking stats or form. It should also reduce your risk while making sure you can grow your bank. We both know the betting world is full of rogues. I’ve worked hard to distance myself from the rogues and rip-off merchants. My reputation is everything to me and I treat it with the respect it deserves. I don’t create betting systems to just sell, I develop each of them to bet with and profit from myself. And unlike most betting gurus, betting makes up the vast majority of my income. Betting is my passion and my job, but if I can help others profit from these techniques and top up my earnings further, then I’m happy to do it, but my focus is always on the system. I’ve removed all the stress and guesswork from betting. You see, I noticed my students started losing when they stopped following the basic rules. Instead of thinking long term and following a simple set of criteria they let emotion take over and start to deviate. That’s one of the main reasons so many ordinary people get stung, because they don’t have the right plan or strategy in place to succeed. 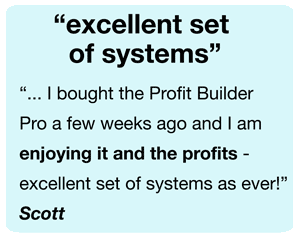 With Profit Builder Pro you’ll have my clear, step-by-step instructions so that there’s no confusion or doubt. Let’s take a look at how much you could make with these plans based on the past 12 months performance. Profit Plan #1 – Make £508.14 – £2,540.70 in the next 12 months from simple weekend bets! This is a simple ‘reverse forecast’ method you can use to capture nice easy gains from the horse racing cards at the weekend (you get the rest of the week off!). You spend just 10 minutes on a Saturday and Sunday, following 2 very simple selection rules and you could be at least £508.14 better off in 12 months. That’s only staking the minimum £2 bets. And if you use it alongside my recommended staking plan (included free with Profit Builder Pro) and compound your winnings, you could pick up regular gains each week and dramatically increase your profits even further. I always recommend using Betfair or a bookie who offers ‘Best Odds Guarantee’ so that you get the best price. Don’t worry if you’re not familiar with either – it’s all explained in your manual. This simple strategy made 254.07 points profit in the last 12 months. At £2 per point you could have made £508.14. At £5 you’d have made £1,270,35. And at £10 you’d have pocketed £2,540.70. This plan is so simple it almost doesn’t require any thought at all. Some ‘experts’ will tell you it’s impossible to make good money from ‘Odds on shots’, but my second method completely turns that theory on its head. Now I can’t give away the secret of how this works here, but what I can say is that I’ve identified certain price ‘triggers’ that you can exploit to pocket steady, incremental gains month on month. Using this 10 minute a day plan I’ll show you how. All you have to do is copy the 5 quick steps I’ve laid out for you in your manual. 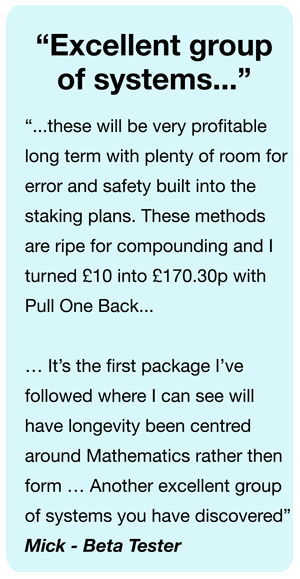 You can use level stakes… or you can use my recommended staking plan to compound and dramatically increase your profits. We’ll look at what compounding can do in just a moment – first let’s take a look at how much you could make to level stakes. It only takes a throwaway 10 minutes a day and yet it would have made you 141.05 points profit in the last year. With £2 stakes you would have banked £282.10… with £5 stakes £705.25… and £1,410.50 with £10 stakes. There are just 3 simple criteria for this one and as long as they’re met you can bet on any race as it’s purely odds driven. I crunched a lot of data to uncover this unique pattern and then tested it and tested it with my own money for over a year until I was convinced it wasn’t a fluke. As with all my strategies I also put it through rigorous trials with independent beta testers. And like my other strategies you only need to set aside 10 minutes a day for this one. All you have to do is follow the steps and profit from the trend. By itself, this method could make you the equivalent to 171.71 points profit over a year. 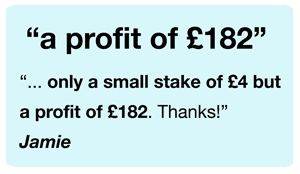 At £5 stakes you’d make £858.55 pure profit… at £10 you’d be up £1,717.10! Add that to the 2 other Bet Plans and you’d have cleared £5,668.30 tax free and for just a few minutes each day. Ok, now things are getting interesting don’t you think? By using these simple, quick and reliable systems (less than 30 minutes a day in total) you start to create a very decent extra tax-free income. Combine this with Bet Plan 1 and Bet Plan 2 and you’d have made £1,133.66 to £2 stakes, £2,834.15 to £5 stakes and £5,668.30 to £10 stakes. This is a perfect starter strategy because it’s super quick, low risk and fun. I was originally going to call this the ‘Sit & Relax’ method because takes just 6 minutes to set up (making it the fastest of all the methods). There’s just one last step depending on what happens (or doesn’t happen!) in the selected game. Don’t worry, you don’t have to watch the game or keep checking online if you don’t want to. I’ll show you a free website you can use which will give you a bleep if there’s a trigger. You can watch TV or do whatever you fancy as long – just as you’re near computer for the next 30 minutes after you place your selection. There are just 4 rules for this one and in the last 12 months you’d have banked 104.15 points following the POB method. This simple technique made 92.47 points profit last year. At £2 stakes you’d make £184.94, at £5 stakes you’d make £462.35… and at £10 you’d be up £924.70! Add that to the 3 other bet plans and you’d have cleared £6,593 tax free and for just a few minutes each day. And here’s where it gets really interesting. Combine all 4 systems and you’d have made 659.30 points in the last 12 months! That means you’d have made £1,318.60 to £2 stakes, £3,296.50 to £5 stakes and £6,593 to £10 stakes. Absolutely not, it’s totally up to you! That’s the beauty of this. Sometimes you’ll login and see there’s no qualifying bet for one of the strategies. No problem, simply jump onto the next one and see if that’s in play. You might only want to focus on one or two strategies at a time. But once you see the simplicity and the results, I’m sure you’ll find those few extra minutes to do all 4! I designed this as a ‘pick ‘n’ mix’ plan so that you can literally tailor it to your life. Simply combine them to increase your profits! Each of these systems is proven profitable in its own right and proven to work individually over the long term. But to maximise your profits I recommend using them in combination. The individual profits from each bet and each system start small but mount up and snowball over time. We’re not looking for risky, greedy high stakes ‘gambles’ here. 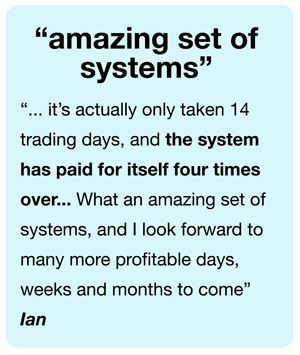 I hate it when system creators gloss over risk and make out that you can just use one system and be guaranteed to make money consistently, it’s simply not true. Every system suffers from losing runs. However by using these strategies in parallel you’ll have an extra layer of built-in protection. By spreading your risk you can profit when the good systems are doing well even if one of the others is under performing. 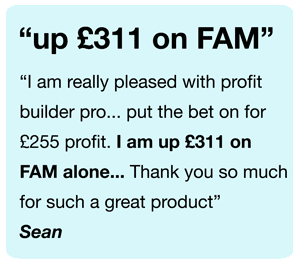 How much would you pay for 4 proven strategies that you could use to bank £1,318.60 – £6,593+ in the next 12 months? These could easily be sold as separate plans. I could simply package each of these proven systems up individually and charge £150 a piece. Each is a proven bank builder and at £600 for all 4 they’d still be excellent value. I designed this specifically so that each strategy could work alongside and complement the other. Instead of relying on 1 strategy you’ll have 4 working for you in tandem. It’s a simple way to diversify your betting income streams without spending hours glued to your screen. If one has a losing day you’ll be backed up by the other. I also want this to be accessible and not something that you can pick and try without breaking the bank. 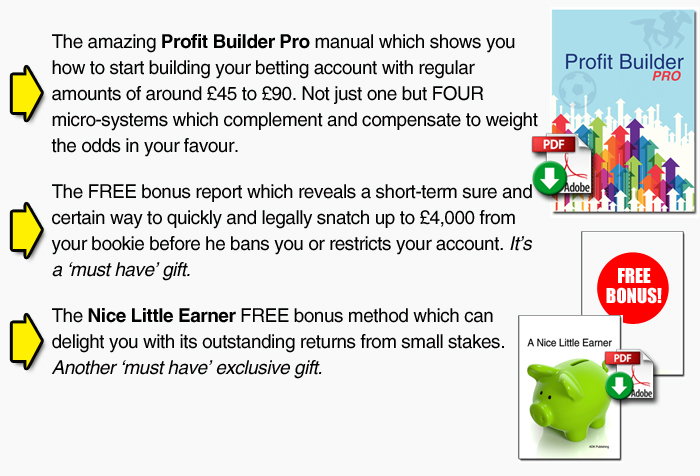 You can try Profit Builder Pro today risk-free. 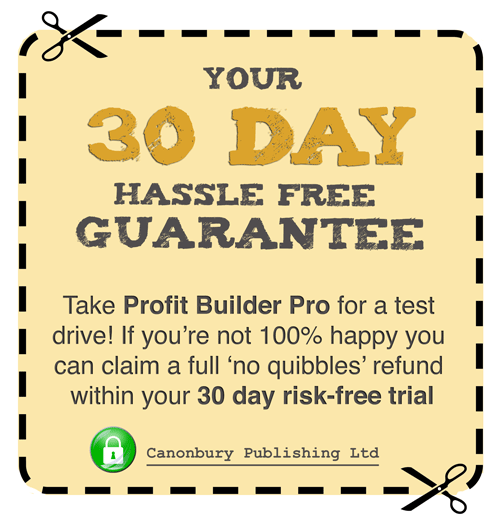 If you find you’re not making as much money as you’d hoped – or you don’t like it for any reason within your 30 day trial period, I’ll give you a full refund. To get started simply click on the link below and fill in your details to start your trial. All I ask is that you follow the instructions and contact me if you need any help or have any questions. I pride myself on my support and there’s no such thing as a stupid question. If in the first month you decide that Profit Builder Pro isn’t for you for any reason, just let me know and I’ll refund you in full. That’s 30 days where you can have access to everything risk-free. This is completely unconditional. There are just 250 spaces available, so if you’re interested please hurry! I pride myself on the support I offer all students and if I feel I’m spreading myself too thinly I’ll shut this page down until I feel happy about letting on new members. This isn’t a marketing trick. If there are too many members I won’t be able to split my time fairly. It’s as simple as that and as ever I’m 100% committed to helping you succeed. 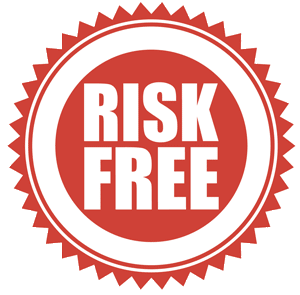 I don’t want you to be disappointed so to claim your RISK FREE trial today just click the following link. Remember you could use this to bank regular tax-free profits from simple strategies that take just 10 minutes to set up and run. I look forward to welcoming you onboard and hear about you banking your first profits. To make the most of any betting strategy you need a starting bank. That’s why I’ve come up with a 2-pronged bonus gift to help you hit the ground running. This is the best method I know to help you build up a risk-free bank to get you started. In a series of short videos which you can access on the secure member’s website I’ll show you how you could make £600+ from one race alone! You can use this technique on as many races that show this secret signal every week, which makes this the quickest and most lucrative risk-free betting strategy I know of. I can’t reveal anymore about this without giving it away, but as soon as you get onboard make sure you take a look at this bonus. I’ll also show you a simple little method which I created for my own personal use as a fun bet for Saturdays. My Saturday’s little fun bet has blown my socks off with its amazing performance. PPS. Still undecided? Let me answer any burning questions you might have! Absolutely not! You can pick and choose which strategies you want to use and when you want to use them. However I recommend using 2 or more (or better still all 4 strategies) for the maximum reward. Nope! This is a one-time-only payment which gives you access to everything you need. Yes! There’s a members’ only website with training videos and of course any updates to the systems. I’ll be here for any further updates or help. If you can use Betfair and/or other bookmakers legally in your country then you can use this. Obviously this was designed for the UK so bear in mind timezones! The good news is you can get started right away! You can order now, read through the manual, watch the videos and start using it today. WEALTH WARNING: You should only gamble with money you can afford to lose. Whilst we take every care to provide the very best advice no claim is made or implied as to its suitability fitness for any purpose. Canonbury Publishing Ltd and the system tipsters cannot take any responsibility for losses arising from the adoption or non-adoption of its advice or information.